The ongoing race to build the cheapest, most versatile 3D printer continues with the impending launch of the DeltaMaker. Founded by a small group of engineers out of Orlando, Florida, the DeltaMaker puts its own spin on the growing personal electronics revolution, matching the print resolution of the MakerBot Replicator 2 while offering a larger overall build envelope and, at US$1,599 dollars, costs $600 dollars less. The DeltaMaker gets its name from delta robots first invented in the 1980s that utilize three sets of parallel arms to control the motion of an end effector (which in this case is the print head) while locking its planar orientation. Like most options on the market, it’s a Fused Filament Fabrication (FFF) printer that uses 1.75-mm filament ABS or PLA, and builds layers as thin as 100 microns. That’s a resolution four times thicker than the Form 1 Kickstarted last year (which costs about twice as much), but is significantly thinner than cheaper printers like the Solidoodle. 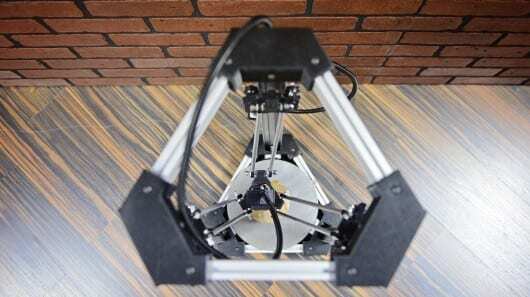 However, unlike most fused filament 3D printers, which slowly drop the build platform to print successive layers, the DeltaMaker’s print head travelsup its three columns as it builds the model. Its creators say that this, in addition to its open air design that offers a 360 degree view of the print, turns the DeltaMaker into a conversation piece rather than a utilitarian object. They suggest people will put it in a prominent place inside their homes, and that artists will display the working printer at a gallery show … and we tend to agree.